The global polyethylene wax market seems consolidated in nature, as five companies hold two-third of the total revenue share in the market, observed by Transparency Market Research. Some of the leading companies in the market are WIWAX, The International Group Inc., SCG Chemicals Co., Ltd., Mitsui Chemicals America, Inc., and Honeywell International Inc. Recently, SCG Chemicals Co., Ltd., a part of the Siam Cement Public Company Limited (SCG) has joined the Capricorn Sustainable Chemistry Fund (CSCF) as limited partner. This partnership will help in bringing future corporate venturing insights and opportunities in the sustainable chemicals field. As the partnership will also lead to increase the geographical reach of both companies with which they can access new markets. Various companies in the market invest in strategic alliance and collaboration to get a firm hold in the market. 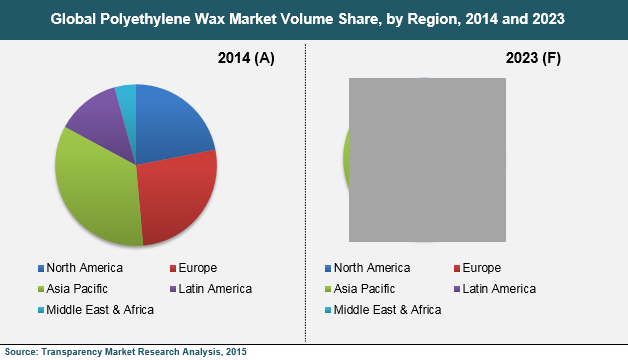 In 2014, the global polyethylene wax market was US$0.25 bn. During the forecast period between 2015 and 2023, the market valuation is expected to reach US$0.35 bn. The market is expected to rise a healthy CAGR of 3.7% during the forecast period. The application of polyethylene wax is seen in candles segment, which contributes more than 20% share in the global market. During the forecast period, this segment is expected to remain highly profitable for the polyethylene wax market. Based on geography, Asia Pacific offers lucrative opportunities for the vendors operating in this market. The dominance of Asia Pacific is attributed to the growing needs for polyethylene wax in China, as it is the hub of several end-use industries such as coating, printing ink, adhesives, packaging, and cosmetics. The demand for polyethylene is increasing widely due to its growing use in paper and paperboard coatings, manufacturing of consumer goods, and in the food and beverage industry. Polyethylene wax has excellent resistive properties towards moisture and grease. For example, the presence of polyethylene in packaging films helps in minimizing the spread of printing ink into the food product. Moreover, rising demand for packaged food across various nations coupled with increasing working population and changing lifestyle dynamics will aim in bringing high growth opportunities for the global polyethylene wax market during the forecast tenure. Moreover, the polyethylene wax is cost effective and can be easily stored and transported. It can also be molded as per the need and do not require huge capital investment. Thus, these properties have increased the use of polyethylene wax at a large scale, which will significantly expand the market in near future. The applicability of alternative products such as Fisher-Tropsch (FT) wax may hamper the demand for the polyethylene wax, thus, resulting in limiting the growth of the global polyethylene wax market. Furthermore, rising crude oil prices, the main source from which polyethylene is derived is also expected to hinder the growth of the market in the forthcoming years. Stringent food packaging regulations are adding into the restraints of the market that will hamper the demand for polyethylene wax used in packaging of food products. However, growing need for polyethylene wax in the asphalt industry as it uses recycled pyrolytic cross-linked polyethylene wax extensively may help the market to recover from these aforementioned restraints.